He was heard saying, "tolong saya boss, tolong saya boss, tolong... (please help boss, please help boss, please help)." KOTA KINABALU: An Indonesian, who was kidnapped by Abu Sayyaf-linked gunmen from waters off Pulau Gaya in Semporna on Sept 11, is seen pleading for help in a video. 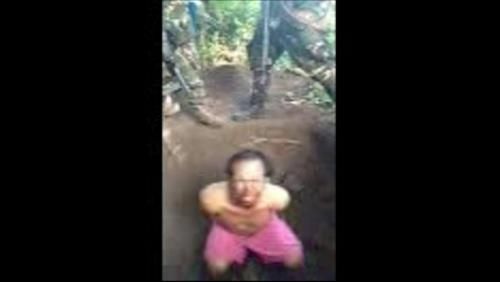 The man, who has been identified as Samsul Sangunim, is seen in a freshly dug hole, crying and pleading for help in the video that apparently made its rounds on social media. According to Filipino-based sources, the video was sent by his Abu Sayyaf captors to the owner of a fishing boat in an apparent bid by the gunmen to demand ransom for his release. Samsul, was kidnapped at gunpoint together with another Indonesian fishing crew member Usman Yusof, 30, while in waters off Pulau Gaya in Semporna . Usman managed to flee his abductors on Dec 5 and has been reunited with his family in Indonesia. Samsul is being kept together with three other kidnap victims - a Malaysian and two Indonesians- who were grabbed by gunmen from the fishing boat in waters off Kinabatangan close to the Tawi Tawi chain of islands in the Philippines. It is believed that most negotiations for the hostages were being made directly with the families or boat owners. According to Philippines media reports, the Abu Sayyaf group had demanded 4mil pesos (about RM400,000) for the safe release of Usman and Samsul.